BACKGROUND: This study was subjected to investigate different pharmacological properties of ethanol extract ofSolena amplexicaulis root. RESULTS: The extract contains flavonoid, alkaloid, saponin and steroid compounds. The extract exhibited excellent antioxidant activity in DPPH radical scavenging activity. The extract also showed potent activity in brine shrimp lethality bioassay. The LC50 value was found to 44.677 µg/ml. The extract showed better anti-bacterial activity against gram-negative bacteria. In antifungal assay, the maximum 79.31% of anti-mycotic activity was observed against Aspergillus ochraceus while minimum 44.2% against Rhizopus oryzae. MIC value ranged between 1500 - 3000 µg/ml. The extract was found moderately toxic with a 24-hr LD50 value of 81.47 mg/kg in Swiss albino mice. The degree of inhibition by the ethanolic extract of the root was found less than that of standard analgesic drug diclofenac sodium. The extract also showed moderate anti-inflammatory and antinociceptive activity and anti-diabetic property. Reducing power of the extract was comparable with standard ascorbic acid. Moderate in vitro thrombolytic activity, lipid peroxidation inhibition property, metal chelating ability and stress-protective activity was also observed. CONCLUSION: Ethanol extract of Solena amplexicaulis root can be valuable for treatment of different diseases. Plants are capable of synthesizing secondary metabolites  which can be used for the new drugs discovery and development. Medicinal plant extracts are potential source for the development of new agents effective against infections currently difficult to treat. Antimicrobial activity of different herbal extracts has been reported against many human pathogens [2-4]. Recently, 546 species have been identified as having medicinal properties and therapeutic use . The medicinal values of those plants possess some chemical active substances that produce a definite physiological action on the human body and animal health. The most important bioactive substances are alkaloid, tannin, flavonoid and phenolic compounds . Drugs which are used presently for the management of pain and inflammatory conditions are either steroidal like corticosteroids or non steroidal like aspirin. All of these drugs possess more or less side and toxic effects like renal failure, allergic reactions, hearing loss or they may increase the risk of hemorrhage by affecting platelet function . Solena amplexicaulis is a perennial dioecious climber with tuberous root found throughout Asia mainly growing in hilly dry deciduous forests, scrub jungles. The tubers, leaves and seeds are extensively used in traditional system for various ailments like hepatosplenomegaly, spermatorrhoea, appetizer, cardiotonic, diuretic and thermogenic, haemorrhoids and invigorating [8-10]. The leaves have good anti-inflammatory activity and also prescribed for skin lesions and other skin diseases . The whole plant is determined to be a potential source of natural antioxidant activity [12,13] and also used for the treatment of diabetes . It is distributed in China, India, Malaysia, Myanmar, Nepal, Pakistan, and Srilanka. In Bangladesh this species is found in Chittagong, Chittagong Hill Tracts, . Except anti-inflammatory activity  antioxidant  and antibacterial  of Solena amplexicaulisthere is no published work on the pharmacological effect of root extracts of the plant. The previous studies were done with leaf and stem or the whole plant. Hence, the present study was considered worthwhile to determine the antioxidant, antimicrobial, cytotoxic, toxic and analgesic properties of crude extract of the root of the plant. Qualitative phytochemical tests of Solena amplexicaulis were performed for the ethanol extract of the root. The results of various chemical tests for the detection and identification of chemical constituents were summarized in Table 1. (SAET denote for ethanolic extracts of Solena amplexicaulis root; (+) = present; (-) = Absent). The total phenol and total flavonoid contents of Solena amplexicaulis root of ethanol extract were expressed in Gallic acid and Quercetin equivalents respectively. Total phenolic content was 12.36 mg/g Gallic acid equivalent and total flavonoid content was 18.9 mg/g Quercetin equivalent. Total ascorbic acid content was found to be 0.357 mg AA/g. 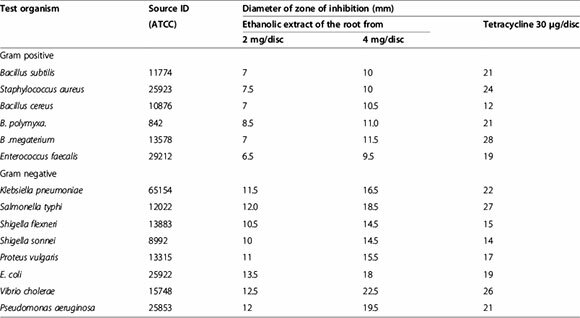 The DPPH free radical scavenging activity of Solena amplexicaulis root ethanol extracts, and ascorbic acid is shown in Table 1. Among the eight different concentration used in the study (10, 50, 100, 200, 400, 600, 800 and 1000 µg/ml) ascorbic acid showed 50.78%, 73.62%, 84.27%, 90.13%, 92.52%, 94.52%, 97.06% and 98.66% scavenging activity where highest scavenging activity was 98.66% at concentration 1000 µg/ml. On the other hand, Solena amplexicaulis root ethanol extract showed 60.29%, 62.21%, 64.14%, 66.79%, 69.46%, 72.37%, 77.60%, 93.97% scavenging activity at the aforesaid eight different concentrations where highest scavenging activity of Solena amplexicaulis root ethanol extracts were 93.97% (1000 µg/ml). Scavenging activity (%) or % of inhibition was plotted against log concentration and from the graph IC50 (Inhibition concentration 50) value was calculated by linear regression analysis. 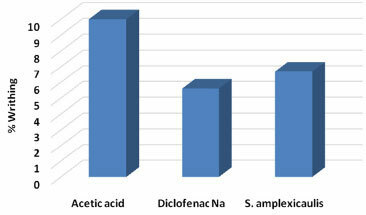 IC50 value of ascorbic acid and Solena amplexicaulis root ethanol extracts were 5.46 and 4.18 respectively (Figure 1). 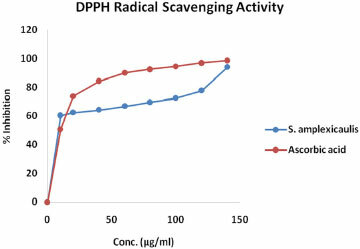 Figure 1 DPPH radical scavenging activity of Solena amplexiculisroot extract. 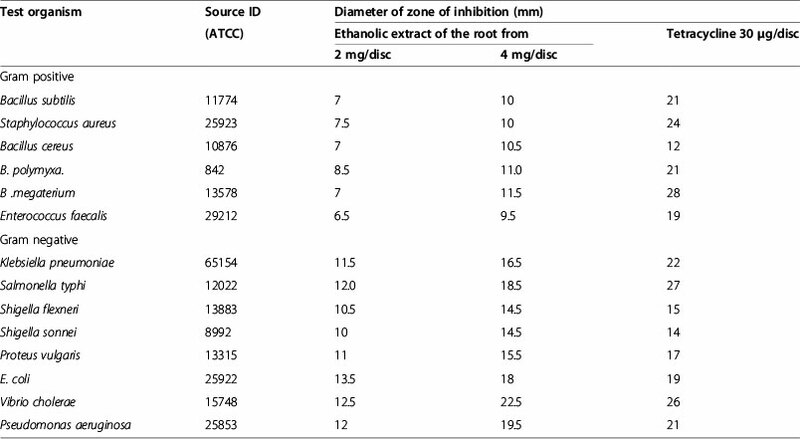 The results of antibacterial activity of the ethanolic root-extract of the plant Solena amplexicaulis are presented in Table 2. In comparison to reference standard tetracycline (30 µg/disc), the ethanolic root-extract exhibited moderate antibacterial activity against selected organisms. The antifungal effect of the ethanolic root extract of Solena amplexicaulis in various concentrations is presented in Table 3. The strongest antifungal effect was shown by the plant root extract with regard to Aspergillus ochraceus and A. niger, as the percent of inhibition was 79.31 & 62.10 respectively at 5 mg/plate. More weakly expressed was its effect with regard to A. ustus. 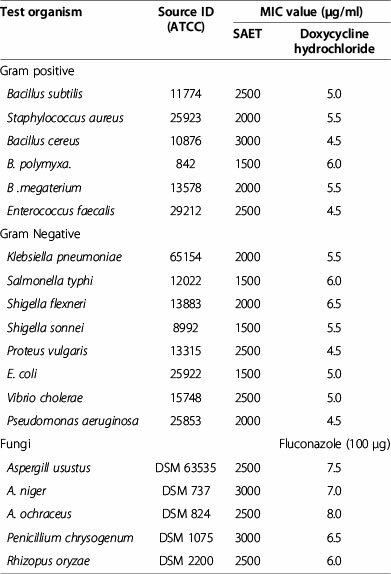 The MIC value against Gram positive and Gram-negative bacteria ranged from 2,000 to 3,500 µg/ml, respectively (Table 4). Lowest MIC value (1500 µg/ml) of SAET was against Bacillus polymyxa, Salmonella typhi, Shigella sonnei and E. coli. MIC value was higher (3000 µg/ml) against Bacillus cereus, Aspergillus niger and Penicillium chrysogenum. MIC value was much higher than control antibiotic, Doxycycline hydrochloride. Considering the impurities and complex composition of the extract, MIC value against the pathogens included in this study was promising. For the determination of cytotoxicity by Brine shrimp lethality bioassay, seven different concentrations (7.81, 15.63, 31.25, 62.5, 125, 250, and 500 µg/ml) of the ethanolic extract of Solena amplexicaulis root were used. 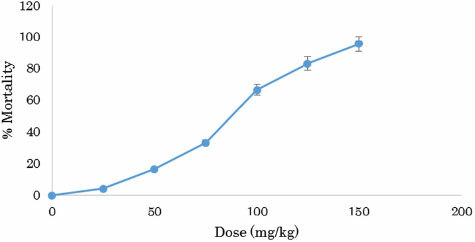 The ethanolic root extract showed lethality in a dose dependent manner (Figure 2). "BioStat -2007" computer software was used for the calculation of probits for each concentration. Probits obtained by means of Finney method were then plotted against corresponding root-extract log concentration and from the plot LC50 (log concentration 50) value was calculated by regression analysis. LC50 value of the root-extract of Solena amplexicaulis was found 44.677 µg/ml with 95% confidence limit with lower limit 32.354 and upper limit 57.927 µg/ml. Figure 2 Cytotoxicity of S. amplesiculis root ethanol extract (SAET). Based on the mortality data 24 hours after the treatment, the LD50 value of the test substance for mice was found 81.54 mg/kg bodyweight with the confidence limit of 59.13-101.98 mg/kg bodyweight at 5% level of significance. The regression line equation was found as Y = - 7.1289 + 6.3633*Log10 (Dose) where Y was the probit mortality of the experimental mice (Table 5). 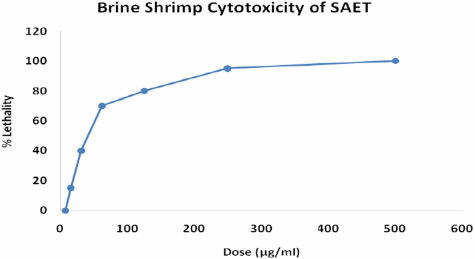 Figure 3 shows acute toxicity pattern of SAET with regard to increasing concentration. Here, Y and X indicate probit and Log10 (Dose) respectively , * mean multiplication. Figure 3 Acute toxicity of SAET. Acetic acid induced writhing response model were used for the assay of analgesic activity of Solena amplexicaulis roots ethanol extract. After injecting of 1% ( v/v) acetic acid solution (3.3 ml/kg body weight) intra-peritoneally in mice, the control animal showed 82 writhing count/20 minutes but, administration of diclofenac sodium resulted in significant reduction of writhing count, from 82 to 39.5. On the other hand, ethanolic extract of the root from Solena amplexicaulis abridged the writhing count, from 82 to 60.5, 70, and 79.5 at the dose of 35 mg/kg bodyweight of mice, 25 mg/kg bodyweight of mice, and 15 mg/kg bodyweight of mice respectively (Table 6). The effect of the root extract and diclofenac sodium was statistically analyzed by Student's t test. The treatment of animal with the root extract (35 mg/kg, 25 mg/kg, and 15 mg/kg) and diclofenac sodium was found significant (P < 0.001) as compared to control group. The degree of inhibition of Solena amplexicaulisroots extract (26.22%, 14.63%, and 3.05%) was found less than that of diclofenac sodium (51.83%) (Figure 4). **p < 0.001, Here, All the value are expressed as Mean ± SEM. Figure 4 Effect of ethanolic root-extract of Solena amplexicaulis on acetic acid induced writhing response mice model. Solena amplexicaulis produced a potent anti-inflammatory activity against the paw edema in Swiss albino rats when compared with reference standards the potency was found to be inversely proportional to the time (Table 7) taken for reduction in the paw volume. All values are expressed as mean ± SD; P < 0.05. The extract produced significant writhing inhibition comparable to the standard drug diclofenac sodium (Figure 5). The results of the test showed that SAET 500 mg/kg exhibit highly significant (P < 0.001) inhibition of writhing reflex by 6.7% while the standard drug diclofenac inhibition was found to be 5.6% at a dose of 25 mg/kg body weight. Results suggest that ethanolic root extract of S. amplexicaulis might possess antinociceptive activity. Figure 5 Antinociceptive activity of SAET. In an array to explore the anti-diabetic activity, ethanolic root extract of Solena amplexicaulis was screened for the α-amylase inhibitory property. Ethanol extracthas significantly higher percentage of α-amylase inhibition, that is, 41.3% and 62.58% at 25 and 50 µg/mL, respectively, while for acarbose of same concentration, the value was 33.25% and 49.57%. The reducing power of the extracts was moderately strong while increasing dose it shows little increment. At 100 µg/ml concentration, reducing power of SAET was 0.24 whereas that of ascorbic acid was 0.26. But, with increasing concentration (200 - 400 µg/ml), reducing power of SAET increased from 0.36 to 0.48 whereas that of ascorbic acid increased from 0.38 to 0.53 (Figure 6). Figure 6 Reducing power of SAET. Streptokinase (SK) (positive control) showed 68.57 ± 1.67% clot lysis while sterile distilled water (negative control) showed only negligible clot lysis (7.68 ± 0.578%). The mean difference in clot lysis percentage between positive and negative control was very significant (p value < 0.0001). Ethanolic root extract of S. amplexicaulis showed 48.51 ± 1.25% clot lysis and S. amplexiculis in combination with Streptokinase showed 74.29 ± 0.79% clot lysis activity. Percent clot lysis obtained after treating clots with herb and appropriate controls is shown in Figure 7. Figure 7 In vitro Clot lysis by Streptokinae, Solena amplexicaulis,Solena amplexicaulis in combination with Streptokinase and water. 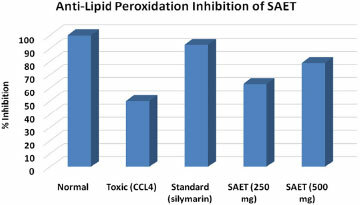 The lipid peroxides scavenging activity of SAET was investigated and compared with standard (Salymarin). At a concentration of 250 µg/ml, the % inhibition was 62.89% and at 500 µg/ml, the %inhibition was 783.84% while inhibition of CCl4 and Salymarin was 49.95% and 92.77% respectively (Figure 8). Figure 8 Lipid peroxidation inhibition of SAET. The chelating effect on the ferrous ions by ethanolic root extract of S. amplexicaulis is presented in Table 8. The extracts exhibited the ability to chelate metal ions. Metal chelating activity of SAET at 1000 µg/ml concentration was 29.35 ± 0.65 compared to 53.62 ± 0.25 of standard EDTA of Same Concentration. At 5000 µg/ml concentration, % inhibition of SAET was 41.65 ± 0.44 whereas that of standard EDTA was 94.67 ± 0.18. Values are expressed as mean ± SD, *significantly different (P < 0.05). The growth of yeast cells with prior exposure to H2O2 (2 mM) in presence and absence of SAET showed significant growth difference and extract treated cells grow normally in presence of stress compounds compared to growth of control cells. This shows that the protective effect of SAET may be attributed to the presence of various anti-oxidant compounds Table 9.
aAverage + SD. bSignificantly different from the untreated cells (control) by the analysis of variance (ANOVA) and Dunnettfs t-test (p < 0.05). cSignificantly different from the stressing agents by the analysis of variance (ANOVA) and Dunnettfs t-test (p < 0.05). Plants produce a lot of secondary compounds as natural protection against microbial and insect attack. Some of these compounds are toxic to animals, but others may not be toxic. Indeed, many of these compounds have been used in the form of whole plants or plant extracts for food or medical applications in human  because plants are the natural reservoir of many antimicrobial, anticancer agents, analgesics, anti-diarrheal, antifungal as well as various therapeutic activities . The total phenol of Solena amplexiculis of ethanol extract were 12.36 mg/g Gallic acid equivalent and total flavonoid content was 18.9 mg/g Quercetin equivalent. Total ascorbic acid content was found to be 0.357 mg AA/g. Acceptance of medicines from such plant origin as an alternative form of healthcare is increasing because they are serving as promising sources of novel antibiotic prototypes . Some of the phytochemical compounds e.g. glycoside, saponin, tannin, flavonoids, terpenoid, alkaloids, have variously been reported to have antimicrobial activity . Free radicals from oxidative stress are involved in many disorders like atherosclerosis, angina pectoris, neurodegenerative diseases and cancer. Antioxidants due to their scavenging activity are useful for the management of those diseases. DPPH assay is one of the most widely used methods for screening antioxidant activity of plant extracts. The quantitative determination of antioxidants explored that high quantity of scavenging substances are found to be  in Solena amplexicauliswhich plays the key role in showing free radical scavenging activity of this plant. Solena amplexicaulisroot exhibited significant DPPH free radical scavenging activity with IC50 value of 4.18 µg/ml. Reducing power of Solena amplexicaulis is also moderately strong. Venkateshwarlu et al. reported the presence of phenolic (gallic acid content is 63.63 µg/mg, respectively), and flavonoid compounds (41.18 µg/mg) present in Solena amplexicaulis. The phenolic compounds may contribute directly to the antioxidative action . The results obtained in the present study indicate that the SAET is a potential source of natural antioxidant activity which is in accordance with the study of Venkateshwarlu et al. .
Crude extract at the concentration of 1 mg/disc showed 7, 7.5 and 7 mm zone of inhibition diameter against Gram-positive Bacillus subtilis, Bacillus cereus, and Bacillus megaterium, respectively and 7 mm diameter against Gram-negative Shigella sonnei. On the other hand, standard antibiotic Tetracycline (30 µg/disc) showed significant antibacterial activity against all tested gram positive and Gram-negative bacteria except proteus vulgaris. Results implicated that the Gram-positive bacteria were more sensitive to the extract than the gram-negative bacteria. Bacillus spp. were the most susceptible bacteria in this study. In a previous study, ethanolic stem bark extract of Clausena heptaphylla showed 5.5, 5.9 and 6.4 mm zone of inhibition diameter at the concentration of 2 mg/disc against Gram-positive Bacillus subtilis, Bacillus cereus and Bacillus megaterium,respectively and 3.1, 2.5, 1.8, 3.6 mm diameter against Gram-negative Salmonella typhi, Shigella flexneri, Proteus vulgaris and E. coli.. Stem bark extract showed significant zone of inhibition against Aspergillus ustus, Aspergillus niger and Aspergillus ochraceus in antifungal assay. Solena amplexicaulis showed zone of inhibition to almost all the strains (at dose 3 and 5 mg/disc). Solena amplexicaulis has almost similar activity as Clausena heptaphylla in this study . The present study justifies the claimed uses of Solena amplexicaulis in the traditional system of medicine to treat various infectious diseases caused by the microbes. Solena amplexicaulis showed a significant degree of anti-fungal activity (Table 3). The maximum anti-mycotic activity 79.31% was shown against A. ochraceus. Plant natural compounds are important source of mycotoxic compounds and they may provide a renewable source of useful fungicides that can be utilized in anti-mycotic drugs against infection of A. ochraceus. The effect of extract against A. niger was also higher implying that this plant can be utilized as anti-mycotic drugs against infection of A. niger in patients with pulmonary tuberculosis . Moderate anti-mycotic effect was found against Aspergillus ustus at the concentration of 3 and 5 mg/ml. Fluconazole was used as standard antifungal agent to compare the potentials of extract. There are, however, alarming reports of opportunistic fungal infections which describe that the resistance of the organisms increased due to indiscriminate use of commercial anti-microbial drugs commonly used for the treatment of infectious disease. This situation forced the researchers to search for new anti-microbial substance from various sources including medicinal plant. Karthika and Paulsamy  reported that S. Amplexicaulis extracts of leaf and stem exhibited antibacterial and anti-fungal activity. The findings revealed that medicinal plant Solena amplexicauliscan play a vital role in combating fungal resistance. Lowest MIC value (1500 µg/ml) against B. polymyxa, Salmonella typhi, Shigella sonnei and E. coliwas showed by the extract. Lowest MIC value (2500 µg/ml) was found against fungi such asAspergillus ustus, A. ochraceus and Rhizopus oryzae. MIC value of the extract against the test pathogens are much higher than that of Doxycycline hydrochloride which may be due to the crude nature of the pigment extracts. Natural compounds from plants are important source of mycotoxic compounds and they can be a source of useful fungicides that can be utilized in anti-mycotic drugs against infection of A. ochraceus. Different pharmacological properties can be assumed on the basis of brine shrimp cytotoxicity of any plant extract . In this research, six different concentrations (7.81, 15.62, 31.25, 62.5,125, 250, 500 µg/ml) of Solena amplexicaulis extract were used to determine its cytotoxicity by brine shrimp lethality bioassay. The extract showed lethality in a dose dependent manner. LC50 value of Solena amplexicaulis ethanol extract was found 44.68 µg/ml (Figure 2). The LC50 value found in this study was very significant suggesting the ethanol extract of Solena amplexicaulis has high potentiality to kill cancer cells as well as pests . This significant lethality of the crude plant extract (as LC50 value less than 100 µg/ml) to brine shrimp is indicative of the presence of potent cytotoxic compounds which warrants further investigation. From the study, it was observed that the water-soluble absolute ethanolic extract of the root ofSolena amplexicaulis (Gandhi) exhibited toxic properties to the experimental animals (Swiss albino mice). The extract showed its acute toxicity on mice when administered orally in the range of 50 to 150 mg/kg bodyweight of mice. The 24-hr LD50 values were found to be 81.54 mg/kg bodyweight of mice. However, it caused no mortality in the treated mice and rats when they were treated orally at the doses of 25 mg/kg and 75 mg/kg bodyweight respectably, though some physiological changes occurred. It might have the properties of muscarinic activity and respiratory analeptics on mice and rats. It might also cause visceral changes in mice as well as possess central depressant property to a variable extent on mice. Thus, the study presented here indicates the antinociceptive action of the ethanolic root extract in the acetic acid writhing test could be due to the inhibition of the release of TNF-α, interleukin-1β and interleukin-8  by resident peritoneal cells. The root extract of the plant showed significant inhibition (P < 0.001) of acetic acid induced writhing response of mice. So it can be suggested that Solena amplexicaulis root extract has potential analgesic action . In the present study, pre-treated oral administration of extract was effective in reducing the oedematogenic response evoked by carrageenan in rats between the 2nd and 4th hours after the injection. This evidence allows us to suggest that anti-inflammatory actions of the extract are related to the inhibition of one or more intracellular signaling pathways involved in the effects of several inflammatory mediators. Anti-inflammatory activity increased with the increase in the dose of the extract. Significant anti-inflammatory activity of SAET also corresponds to the presence of flavonoid compounds in the extract as flavonoids are considered to possess anti-inflammatory activity . SAET showed significant antinociceptive activity compared to diclofenac sodium. Acetic acid-induced writhing model represents pain sensation by triggering localized inflammatory response. Acetic acid, which is used to induce writhing, causes algesia by liberation of endogenous substances, which in turn excitethe pain nerve endings  localized inflammatory response. Leaf and stem extracts of S. amplexicaulis has been reported to possess anti-diabetic activity in terms of their α-amylase inhibition activity [30,31]. Ethanolic root extract also showed better anti-α-amylase property (62.58% at 50 µg/mL) than standard drug acarbose (49.57% at 50 µg/mL). This enzyme inhibitory activity of SAET may be attributed to presence of different active compounds such as flavonoids, glycosides and polyphenols. In the present study, the reducing power of the SAET was evaluated measuring the conversion of a Fe3+ ferricyanide complex to the ferrous form.The reducing power of the investigated extract linearly increased with concentration. At 100 µg/ml concentration, reducing power of SAET was 0.24 whereas that of ascorbic acid was 0.26. 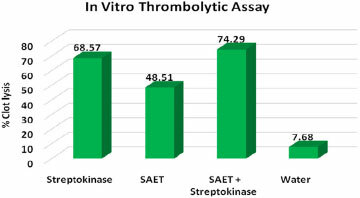 In vitro thrombolytic activity of SAET is significant with 48.51% clot lysis capability compared to that of Streptokinase (68.57%). It can be considered for compound isolation in order to detect future anti-tumour compounds. In vitro thrombolytic activity of SAET is significant with 48.51% clot lysis capability compared to that of Streptokinase (68.57%). It can be considered for compound isolation in order to design future anti-tumour drug. SAET had appreciable lipid peroxidation inhibition activity (Figure 8). At a concentration of 250 µg/ml, the% inhibition of Lipid peroxidationwas 62.89% and at 500 µg/ml, the % inhibition was 78.84% while % inhibition of CCl4 and Salymarin was 49.95% and 92.77% respectively. Elevated lipid peroxidation is a common trait of cancer  and results suggest SAET can be used in cancer for its anti-lipid peroxidation capability and can protect cells chain reaction from breaking down due to lipid peroxidation. Non-ligand or poorly liganded iron may be the basis of many diseases involving cell death and apoptosis . Thus, the chelating ability of the extracts in regards to ferrous ions was investigated. Even though the extracts were not as strong Fe2+ chelators as EDTA, the investigated extract demonstrated notable chelating properties. Ferrous ion chelating activity of SAET was close to the results of Karthika et al.. Metal chelating capacity was significant as they reduced the concentration of catalyzing transition metal in lipid peroxidation. Spot assay result provides us an indication that SAET exert protective activity to cells against stress and agents causing DNA damage may be due to different compounds it possess with antioxidant activity. This study suggests that Solena amplexicaulis extract possesses some potentials in free-radical scavenging activity, cytotoxic and analgesic effect but it has low antimicrobial (antibacterial and antifungal) activity. The toxic nature of the alcohol extract is evident from the acute oral toxicity. Since, crude ethanol extract of Solena amplexicaulis showed antimicrobial, cytotoxic and analgesic effect, it can be assumed that different active secondary metabolites were present in this extract. These can be a strong scientific evidence to use this plant as a useful source of both biological and pharmacological references. However, further studies are necessary to elucidate the specific active compounds in the root extracts of S. amplexicaulis. All the experiments including animal used in this study was approved by the ethical review committee of BCSIR laboratories, Chittagong, Bangladesh. DPPH (1, 1-diphenyl, 2-picrylhydrazyl), TCA (trichloroacetic acid) and ferric chloride, Ascorbic acid was from SD Fine Chem. Ltd. India, ammonium molybdate from Merck, Germany. Mueller-Hinton broth and agar media (Hi media, India), final pH 7.3 ± 0.2 (at 25°C), was used for MIC determination and antibacterial. On the other hand, potato dextrose agar media (Hi media, India), final PH (at 25°C) 5.6 ± 0.2 and artificial seawater (3.8% NaCl solution) were used for the determination of antifungal and cytotoxic effect. Very rare medicinal plant Solena amplexicaulis was collected from various regions of Khagrachari District of Chittagong Hill Tracts of Bangladesh. The plant was identified by Professor Dr. Md. Mostofa Kamal Pasha, Taxonomist, Department of Botany, University of Chittagong, Chittagong, Bangladesh. The fresh roots of Solena amplexicaulis were washed with water immediately after collection and then chopped into small pieces, air-dried at room temperature for about 10 days and pulverized into powder form and stored in an airtight container. 2 kg root powder was macerated in 6 L pure ethanol for 7 days at room temperature. After 7 days, root's ethanolic extract was filtered off through a cotton plug and finally with a Whatman No. 1 filter paper. Then the solvent retaining in the crude extract was evaporated under reduced pressure below 50°C through a rotary vacuum evaporator. The concentrated extracts were collected in a Petri dish and allow to air dry for complete evaporation of ethanol. The whole process was repeated two times and finally, 80 gm concentrated Solena amplexicaulis root extract (SAET) was obtained (yield 4% w/w) which was kept in refrigerator at 4°C. Freshly prepared crude extracts of Solena amplexicaulis root were subjected to qualitative test for the presence of different constituents using the following reagents and chemicals, flavonoids with the use of Mg and HCl; tannins with ferric chloride and potassium dichromate solutions and saponins with ability to produce stable foam and steroids with Libermann Burchard reagent, reducing sugars with Benedict's reagent and observed color change in respective . Folin-Ciocalteu method was used to determine the total phenolic content; Folin-Ciocalteu oxidized the extract whereas sodium carbonate neutralized it. Blue color formed and the absorbance was measured at 760 nm after 60 min by using gallic acid (GA) as standard. Total Phenolic content was expressed as mg GA equivalent/ gm of extract . Method described by Meda et al. was followed to determine the flavonoid content where quercetin was used as standard. Total ascorbic acid (ASC) content of the extract was determined according to the method described by Roe and Kuether . The antioxidant activity of the extract is carried out based on the scavenging activity of the Table 1, 1 diphenyl-2 picrylhydrazyl (DPPH) according to the method described by Brand-William et al. .
Cytotoxic activity of plant extract was determined by Brine-Shrimp lethality bioassay as previously described . To determine the in vitro α-amylase inhibition by ethanolic root extracts of Solena amplexicaulis, the standard procedure  was adopted with slight modification. The reducing power of Solena amplexicaulis extract was determined according to the method of Oyaizu . Individuals from whom the blood samples were collected were informed and upon their consent they were included in this study. Samples were taken from adult healthy individual. No children were included in this study. In vitro thrombolytic activity was performed according to Ratnasooriya et al.. The chelation of ferrous ions by the extract was estimated as per the method of Dinis et al. . The in vitro sensitivity of the bacteria to the test material was done by disc diffusion technique  against 6 gram-positive (Bacillus subtilis ATCC 11774, Staphylococcus aureus ATCC 25923, Bacillus cereus ATCC 10876, Bacillus polymyxa ATCC 842, Bacillus megaterium ATCC 13578, Enterococcus faecalis ATCC 29212) and 8 gram-negative bacteria (Salmonella typhi ATCC 12022, Klebsiella pneumonia ATCC 65154, Shigella flexneri ATCC 13883, Shigella sonnei ATCC 8992, Proteus vulgarisATCC 13315, E. coli ATCC 25922, Vibrio cholerae ATCC 15748, Pseudomonas aeruginosa ATCC 25853). All the results were compared with the standard antibacterial drug tetracycline. The poisoned food technique  was used to screen for anti-fungal activity. Minimum Inhibitory Concentrations (MIC) were determined by macro dilution method . Wild type Saccharomyces cerevisiae was used to investigate the effect of extract on the growth of yeast cells, to select the doses of extract used in the adaptive treatments. 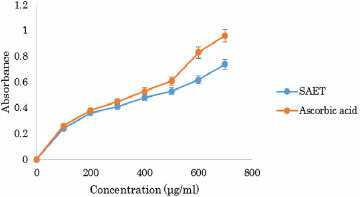 Saccharomyces cerevisiaecells (OD600 of 0.6-1) without and with exposure to increased concentrations of extract (200, 400 and 800 µg/ml) and stressing agent (2 mM) were incubated in a YPD medium for 1 hr at 28°C /160 rpm. In all cases, about 3 µl of yeast saturated cultures after 1 hr incubation were serially diluted (10-1, 10-2, 10-3and 10-4), and were dropped on standard YPDA plates and Hydroxyurea (150 mM) laden YPDA plates. Plates were incubated at 28°C, and growth was recorded after 24, 48 and 72 hrs by counting colony. The lowest concentration was chosen which could improve cell growth compared to cohorts exposed to stress without being treated with plant extract. Swiss albino mice of both sexes weighing between 25 gm and 30 gm were taken from animal house of BCSIR laboratories, Chittagong. The animals were acclimatized to room temperature (28 ± 5°C) with a relative humidity of 55 ± 5% in a standard wire meshed plastic cages for 4 to 5 days prior to commencement of the experiment. During the entire period of study the animals were supplied with standard pellet diet and adlibitum water. Acute toxicity of ethanolic root extract of S. amplexicaulis in mice was determined according to Buluset al..
Analgesic activity was performed according to Vittalrao et al. . The lipid peroxidation inhibition assay was determined according to the method described by Liu et al..
Antinociceptive activity of the crude extract was tested using the model of acetic acid induced writhing in mice . Carrageenan induced rat hind paw edema was used as the animal model of acute inflammation according to the method of Jude et al. .
MGK and SI planned the research work and NUA collected the plant. MR performed extraction and antioxidant activity. RMM and MF performed the antibacterial and antifungal activity. NUA performed brine shrimp lethality assay. RMM and MF drafted the manuscript and all authors have read and approved the manuscript. The authors were thankful to Professor Dr. Md. Mostofa Kamal Pasha, Taxonomist, Department of Botany, University of Chittagong, Chittagong, Bangladesh for the support in identification of the plants.